practiced by Muslim clerics in every major city in Australia. Muslim clerics are now demanding that Shariah law be sanctioned by the Australian government by allowing Muslim clericswho are already doing itto decide divorce cases, child custody issues and financial disputes. That is just the start, with Muslim leaders calling for traditional Islam law to be fully implemented in Australia. The fear of the traditional, native-born Christian Australian people is that they are getting Muslim law by stealth. Keep in mind, this issue is not one of religious freedom, even though the Muslims insist it is. This is about changing the nature of law from societal to a theologicaland its about the physical conflict when the two collide. 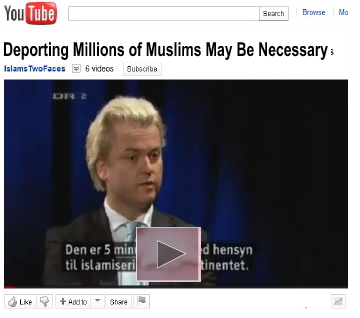 Dutch politician Geert Wilders is fighting the same problem in Holland. Islam and Christianity have collided, and because there are now over a million Muslims in the land of the tulips, the Muslims are getting more aggressive and more threatening. According to Wilders, there are a lot of people in Holland who fear Islamization, they are now throwing the old line communistic globalists out of office because as the volume of people from the Islamic countries increases, the Muslims refuse to assimilate into the Dutch society. Instead, as they grow in numbers and strength, they become belligerent and threatening the native born Dutch. Wilders proposes a total ban on immigration of Muslims into Holland because as they grow in numbers, Muslims in Europe are becoming increasingly troublesome and demanding that the Europeans adopt Muslim customs and traditions and live under Islamic, not European, law. Again, while Australia has never enacted any laws authorizing courts to hear cases based on Islamic law, Shariah law is practiced throughout all of Australia. 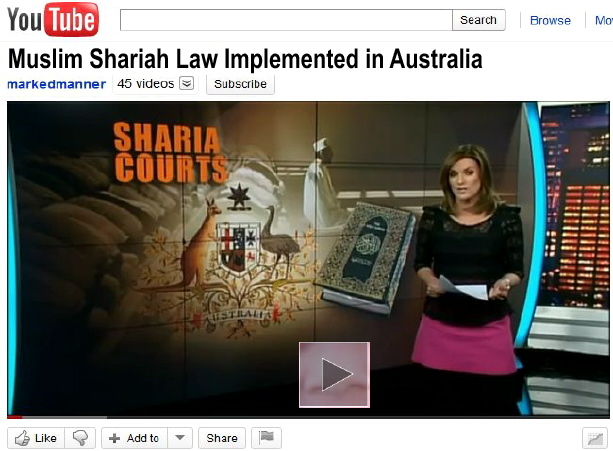 Shariah clearly undermines Australian law, and impacts Australian citizens who are not Islamic. Native born Aussies have commented that they are being to feel like second class citizensin Aussielandbecause as Shariah creeps in, womenall womenare increasingly treated less as equals and more like second class citizens, as is anyone who is not a Muslim. If you are having a problem grasping this reality, spend a summer weekend in Minneapolis, Dearborn or Detroit during the Arab Festival when the Muslims proselyte for converts in the Christian community. Christians, who proselyte in the Muslim community even in the United States will find themselves in trouble as the video in the link, above, shot in 2009, depicts. Note: when you click on the link (aboveshaded type) you will note that the video taken by Acts 17 was pulled by YouTube. I substituted another tape which is the explanation of the two young men who did the 2009 video, and an earlier one in 2008 (also pulled). You will find the new tape interesting. What is happening with the surreptitious implementation of Shariah is very dangerous. As Islam infects the whole world, Scripture suggests that every person in the world will fall under Muslim lawand Islam's ultimate, radical penalty for the nonbeliever, described in Rev. 20:4. While it appears, from Scripture, that its too late to stop it, it's still not too late to slow it down for one or two more lifetimes.